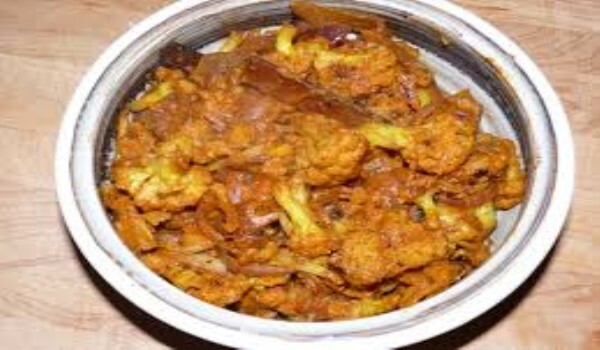 Mughlai Cauliflower is a rich and spicy side dish that goes well with paranthas. Learn how to make/prepare Mughlai Cauliflower by following this easy recipe. Cut the cauliflower into small pieces and fry them in oil till they turn a light brown; keep them aside. Out of the four onions finely chop two and slice the other two into long juliennes. In the same oil that you used for cauliflower, fry the julienned onions till they turn a rich brown colour. Remove them onto an absorbent paper and drain them completely. When they are sufficiently cool, grind them into a paste. Next, roast the poppy seeds and fennel and make a coarse powder of them along with cashew nuts. Heat 4 tbsp of ghee or oil and add sugar to it when sufficiently warm. When it turns golden brown, decrease the heat, add cloves, cardamom and cinnamon, followed by chopped onion. Now, turn the heat back to high and fry till onion turns golden brown. Add the chili powder and the turmeric powder and let them cook; add the kasuri methi and let it cook for a few minutes. Finally stir in the tomato puree, fried onion paste, and salt. Add water if the gravy turns too thick. Add the powdered ingredients and simmer for 2-4 minutes. Add cauliflower, simmer for another five minutes.